The Francisco Bravo Medical Magnet community believes that with the appropriate supports and effort all learners, young and adult, can learn and achieve their learning goals. 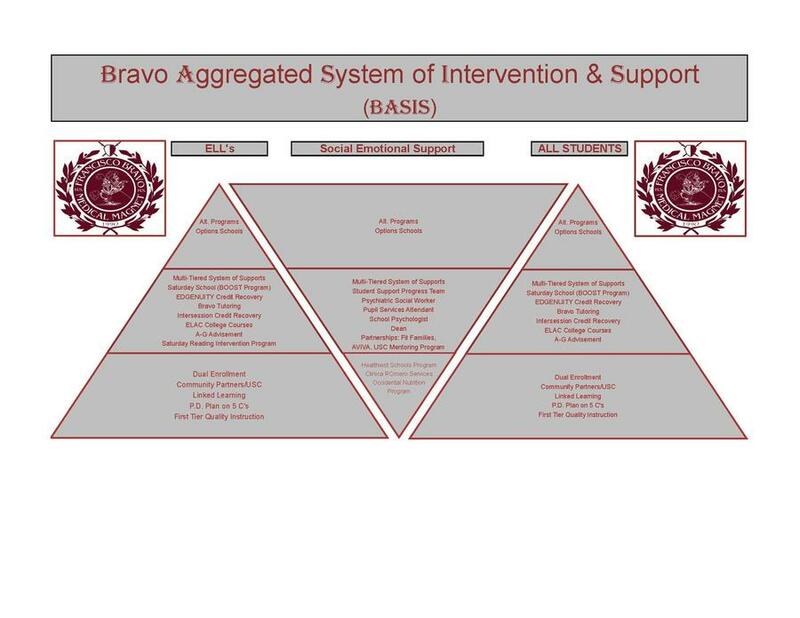 With this in mind, we have designed the Bravo Aggregated Systems of Intervention and Support (BASIS), systems and processes to provide support, intervention, and advancement opportunities for all learners in our community. Our goals are to help students maximize their in-seat learning time, to assist students in making appropriate academic progress from year to year, to achieve 100% graduation rate, and to make sure all students are ready to succeed in the post-secondary program of their choice. We understand and believe that it is impossible to achieve these goals without providing learning, advancement, and leadership opportunities for classroom teachers. BASIS is designed as a comprehensive and cohesive plan to coordinate our resources, time, and energy to make progress towards achieving our LCAP and School Plan for Student Achievement (SPSA) goals and to assure that all students achieve their potential. At Bravo, BASIS utilizes the LAUSD and CDE models of intervention and support services, Multi-Tiered System of Support or MTSS, but systematizes and personalizes the models to address the individual needs of our school based on data-driven decision making and our school culture and climate. Based on the SPSA process per the LAUSD Time Task Monitoring Calendar and in association with the ongoing process of continuous improvement per the accreditation process, Bravo has a clearly defined, broad-based, collaborative planning process that, per district requirements and policies as a Title 1 school, inherently addresses all key steps in the cycle: assessment of data, collaborative decision making including allocation of resources, and implementation, and monitoring of results to restart the cycle. Key stakeholder groups that include faculty, staff, students, parents, and community members all figure into this cycle to provide and accomplish functional duties and to ensure diverse input. Within this cycle, strategically chosen Tier I, II, and III interventions and support services are implemented, developed, personalized, interconnected and coordinated by both adopting the district models and, in many cases, extending and customizing those models to best fit the needs of our students. Through this process of customization and personalization, Bravo’s BASIS model is distinguished from the district’s model of intervention and support services. Consistent with LAUSD LCAP Goal #1 -100% Graduation (State Priority [SP]- 3, 4, 7, 8) and LCAP Goal #2-Proficiency for All (SP-2, 4, 7), Professional Development (PD) is treated as a part of academic intervention and is planned in collaboration with the Instructional Leadership Team (ILT) to design units and lessons that remove learning barriers for all students. While we make sure to address annual district mandated PD initiatives, our PD has gone beyond the district mandate by focusing around our schoolwide selected student learner outcomes of five 21st Century Skills, The 5 Cs: Critical Thinking & Academic Achievement, Creativity and Innovation, Collaboration, Communication, and Culturally Responsive Community Members. Teachers have spent time defining and understanding each of these skills and the role they play in learning. They have spent time learning the variety of ways in which different students can be effective communicators, think creatively, and so on. Specific teachers have spent time sharing best practices during our all-staff PD sessions and have had multiple opportunities to visit and observe one another. In addition to the Five Cs, our teachers have also gone beyond district PD focused on monitoring of student progress to learn how to systematically use interim assessments in the four core content areas to diagnose progress and make strategic supports for specific groups of students as well as use grade distribution reports to diagnose further needs for groups of students. Instructional Technology support has also been a critical component of this process in training teachers to access online student information data in aggregated and disaggregated formats to further assist them in data driven planning and assessment in Tier 1 strategies. Our English Department expanded both the sharing of best practices and the systematic use of interim assessments by creating a model program utilizing our Title 1 funding for PD to meet outside of regular school hours monthly to incorporate horizontal and vertical common planning and assessment into their specific instructional programs, both implementing and monitoring curriculum at the real level of their current students’ progress. In addition, while still utilizing the SBAC interim assessments, the English department has developed its own interim essay assessment based on their specific determined best practices for designing, administering, and evaluating the assessment. Overall SBAC ELA results reflect the effectiveness of this approach. Bravo’s ELA SBAC proficiency results in the first two years of reported testing were markedly high at 86% and 92%. However, in the third year when the district mandated the interim assessments, our ELA proficiency rate fell to 82%. Based on a dissatisfaction with the standardized, mandated process, the English Department designed and implemented the essay assessment during the provided PD time over the course of the 2017-18 year, and ELA SBAC proficiency for last year rose back to 90%. This customized assessment and PD model is being adopted by our other departments this year, particularly Math who have had a similar proficiency rate progression, as the benefits of the program have become apparent. The goal is to provide all teachers with the skills and knowledge to design units, lessons, and assessments that maximize access to content based curriculum to all students. An additional Tier 1 academic intervention identified in LCAP Goal #1 is the implementation of the Linked Learning Approach in the school program. The drive to increase teacher collaboration and integration of academic and CTE curriculum and instruction has also had a positive effect in providing additional supports not only for A-G completion but also Bravo’s multiple Healthcare Industry Sector CTE pathways. As a result, Bravo’s College and Career readiness indicator shows Blue performance levels for all subgroups. Bravo’s model is distinguished from the district Linked Learning model in that students have CTE/Linked Learning curricular experiences across the pathways in 9th and 10th grade, giving them awareness and experience of the available pathways, and then the opportunity to select a specific pathway at the end of 10th grade for 11th and 12th grade focus. This allows Bravo students to have the college-like experience of completing general education requirements in the first two years and then focusing on a specific major in the final two years of undergraduate education. Our Linked Learning/CTE pathways are largely successful because of our unique strong community partnerships (Goal #4 - Parent, Community and Student Engagement: (SP- 2, 6), particularly with the University of Southern California, with whom students in pathways spend time as part of their actual courses in settings such as research labs and hospital locations at the USC Health Sciences Campus. Tier I socio-emotional supports are made available to all students through direct classroom instruction and through a variety of school-wide campaigns. Our schoolwide Tier 1 efforts are largely focused on health related issues both because of their critical importance to student success and because of our magnet theme. In this way, they most clearly connect to LAUSD LCAP Goal #3 - 100% Attendance: (SP-5) and Goal #5 - Ensure School Safety: (SP-5, 8). Our schoolwide efforts were recognized by receiving the bronze level recognition in the national America’s Healthiest Schools program. We promote healthy living habits and social-emotional health through locally designed student-led programs such as the It’s Personal Campaign, Healthy Eating, Anti Bullying Broadcasts, and healthy cafeteria selections. These initiatives lead to positive outcomes. Attendance rates show that about 86% of students are present 96% or more at school. Based on the latest school survey results, 91% of students report feeling safe at school and 92% report that a teacher or adult at school would help them if they reported bullying, about 5% higher than district averages. To provide choice and variety for the various learners in our district, LAUSD offers a rich buffet of services and supports which are connected to two key LCAP goals, Goal #1 - 100% Graduation (SP- 3, 4, 7, 8) and Goal #2 - Proficiency for All (SP- 2, 4, 7). Through our BASIS approach, Bravo incorporates many of the district offerings coupled with our own versions of strategies and programs tailored to meet school needs while addressing LCAP goals. These Tier II academic supports extend the learning time for students in a variety of ways, having a great impact on students remaining on track to successfully complete A-G requirements for college readiness as well as transitioning through grade levels to graduation. Saturday Boost Program: This is a locally designed opportunity for students to make up points in specific courses they are currently taking and where they are not making appropriate progress. This opportunity is designed for students who are close to meeting standards in their course but need that extra time to complete tasks, assignments, and/or show their mastery of standards in the course. EDGENUITY Credit Recovery: This is an online opportunity for students to make up failed courses. Students are only able to “recover” courses previously taken for which they did not earn credits. Students are now allowed to use this as an advancement opportunity. Bravo Tutoring: Also a locally designed opportunity for students distinguished from the district’s Beyond the Bell program, Bravo Tutoring is available to any student for core areas of science, language arts, mathematics, and social studies. The program is offered twice weekly after school. As half of Bravo’s students take the bus because of Bravo’s magnet status, Bravo finances late buses to accommodate students with transportation. Intersession Credit Recovery: Our students have the opportunity to enroll in off-site programs that partner with Bravo for concurrent enrollment opportunities. These offerings are available for students during the winter, spring, and summer breaks. East Los Angeles Community College Courses: These are courses available for all students who want advancement opportunities. Students can enroll in college level courses offered at various college sites, mainly East Los Angeles Community College, and/or after school offered on site at Bravo. A-G Advisement: Students who are chronically behind in academic credits, are required to meet with the A-G Counselor. The counselor meets with the students and their families to create plans to get back fully on-track. Priority is given to 11th and 12th grade students. Saturday Reading Intervention Program: This program is designed to extend learning time for EL students. The program aims to strengthen and expand the reading skills of English learners. All EL students are required to participate in a twice meeting Saturday program. Tier II Socio-Emotional supports are available for specific groups of students. These interventions range from the traditionally offered supports to locally designed or supported programs. The individuals and teams that comprise this layer of support are key components of the BASIS process. Parent engagement is a critical component of these efforts both in committee participation, organizational efforts, and outreach. Our school has entered into unique partnerships with agencies that will provide services to students and their families. The interventions connect to multiple LCAP goals: Goal #3-100% Attendance: (SP-5), Goal #4-Parent, Community and Student Engagement: (SP- 2, 6), and Goal #5-Ensure School Safety: (SP- 5, 8). Multi-Tiered System of Supports (MTSS): The Continuum of Intervention and the Student Support and Progress Team (SSPT): The SSPT is part of the broader MTSS framework which addresses the needs of all students, aligns the entire system of initiatives, supports and resources, and implements continuous systemic improvement processes. The SSPT convenes bi-weekly to design wrap around services for students with chronic progress issues, behavioral, social-emotional, academic, and English Learner progress. This team, composed of administrators, counselors, and specialists, provides intensive and focused supports for the few students who have not made progress even after they have accessed other support opportunities. The MTSS framework and the SSPT are vital components of BASIS. Psychiatric Social Worker (PSW), Pupil Service Attendant (PSA), and School Psychologist: The School Site Council, in conjunction with the administrative team, decided to invest in a full time PSW position to serve our students. The PSW works with specific groups of students (and their families) who are struggling with social-emotional health issues, maintaining a case load and working with academic counselors, support staff, and administration to help students reach and maintain social-emotional health. The PSA monitors and supports attendance of all students. The PSW and PSA are locally Title 1 funded. The psychologist works specifically with our students with Individualized Education Plans, IEPs, and is a member of our crisis team, also supporting other students and their families in times of crisis. Dean: Bravo follows a Positive Behavior Interventions and Supports (PBIS) model schoolwide. Our school invests in a full time dean position who supports the PBIS model by working proactively with all students to maintain a healthy and supportive environment. However, his focus is to support those students whose behavior difficulties have become barriers for their learning or their peers’ learning through PBIS mediation techniques. Parent Engagement: Bravo’s highly active Parent Center works closely with administration to offer extensive parent outreach, education, and support opportunities and helps to coordinate parent participation on the numerous leadership councils vital to BASIS and the SPSA cycle of improvement. Partnerships: Bravo extensive partnerships with a number of agencies provide additional social-emotional and physical health supports. Programs such as USC Fit Families, AVIVA, and USC Mentoring work with students and their families to teach healthy living habits and skills, and to provide family counseling, addiction counseling, gang intervention, and other supports. Our partnerships also offer students extended opportunities for volunteer and health sciences experiences, allowing them to fulfill a number of Bravo’s extracurricular requirements. Tier III services are limited. The Bravo community believes that we will work to keep every single one of our students and provide the appropriate supports. However, there have been a few instances where we have exhausted all services and the student fails to make progress. We coordinate with alternative programs and option schools to find alternative locations and enrollment for students who are unable to make progress. As a model program and practice, BASIS has been a key factor in positive Dashboard results and outcomes in our academic and social-emotional domains. For ELA, Blue Performance Level overall.ELA peaked at 92% levels in 2015-16.Results decreased the following year but returned to 90% in 2017-18.Bravo’s latest results contrast with district and state ranges of 51-56%.Tier I professional development and academic interventions, particularly English Department school based initiatives, have had positive effect. For Math, Green Performance Level overall.Math peaked at 62% proficiency levels in 2015-16. Results decreased the following year but returned to 52% in 2017-18.Bravo’s latest results contrast with district and state ranges of 23-31%. Professional development and academic interventions have had positive effect, but planned Math Department PD on further school based Tier 1 academic interventions based on Bravo English Department practices aim to increase levels. Blue Performance Level overall. Bravo has had an approximate 95% Graduation Rate in last two years in contrast to District, County, and State rates of about 80-83%. All aspects of BASIS can be seen to contribute to success in ongoing transition. Blue Performance Level indicates success in A-G and CTE completion. Bravo’s A-G On-Track to Graduate Rates has risen from 80% on track at end of 2015-16 to 89% last year on track currently, with the greatest percentage reduction in Tier 1 Students Missing 1-2 semester completions with a C or better from 14% to 8% in the same time period.All aspects of BASIS can be seen to contribute to success in ongoing transition. Blue Performance Level. Suspension Rate decreased from 0.1% to 0% in the past two years, a result of our extensive social-emotional and school climate initiatives, particularly with support personnel including the SSPT working proactively with faculty and staff through PBIS to appropriately and holistically address and treat all students.